Use these red brass fittings to modify your pipe system when you need better durability than you get with yellow brass. Red brass can withstand harsh industrial environments since it is highly resistant to heat and corrosion from materials such as water, saltwater, minerals, and soils. These Class 125 fittings are for use in low-pressure pipe systems carrying air, water, oil, steam, or natural gas. Use 90° elbow fittings to make a sharp, perpendicular change in the direction of flow in your system where a small loss of flow pressure is not a problem. 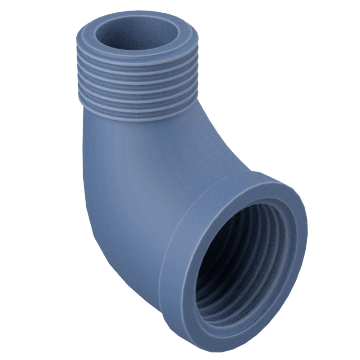 They are similar to 90° street elbow fittings, except they have two female ends to connect to male pipe ends or fittings. 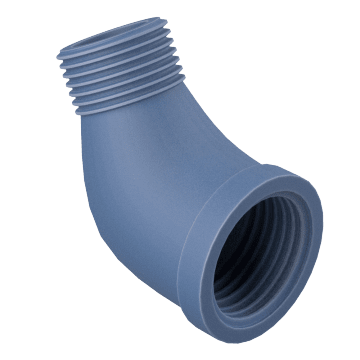 Make a sharp, perpendicular change in the direction of flow in your system where some loss of flow pressure is not a concern with these 90° street elbow fittings. 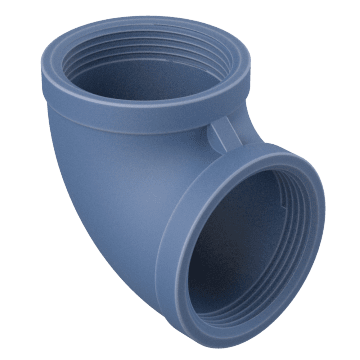 Unlike standard 90° elbow fittings, street elbow fittings have a female end and male end, so they can accept both male and female pipe ends and fittings. 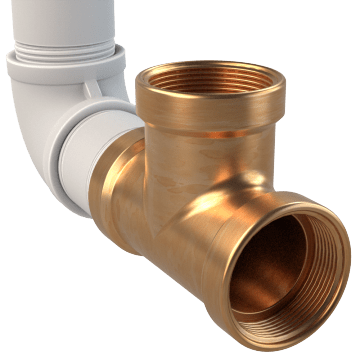 Add a 45° elbow fitting to your pipe ends for a more gradual flow direction change in your system than with a 90° elbow fitting. 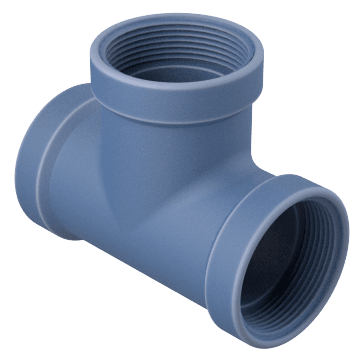 These fittings also restrict pipe flow less than 90° elbows and have two female ends for connection to male pipe ends and fittings. Install these 45° street elbows to get a more gradual change in the direction of flow of your system than with 90° elbows. They also restrict pipe flow less than elbows with a greater degree of bend. 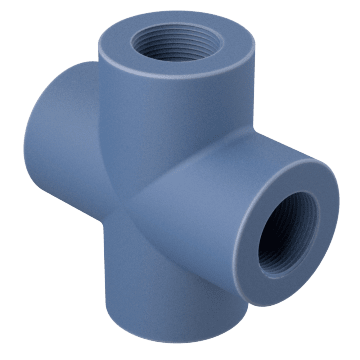 Unlike 45° elbow fittings, these 45° street elbow fittings have one female end and one male end, so they can accept both male and female pipe ends and fittings. 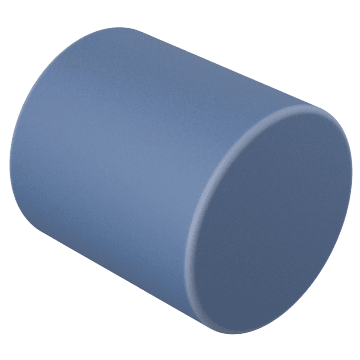 Combine, change, or divide the flow of materials through pipes with the same diameter using these tee fittings. The middle port is set at a 90° angle to the connections on either end. They have three female ports that accept male pipe ends and fittings. Also known as four-way fittings and cross branch lines, crosses redirect the flow of material through your pipe system. They have female ends for connecting four male pipe ends or fittings. Join pipes of the same diameter with couplings to create longer pipe or extend your pipe run. They have two female ends for connecting with two male pipe ends or fittings. 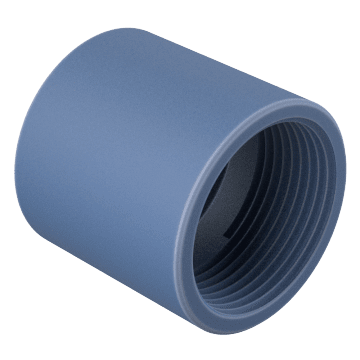 Connect pipe with a larger diameter to pipe with a smaller diameter to reduce the size of the pipeline using these reducing couplings. They have two female ends for connecting with two male pipe ends or fittings. 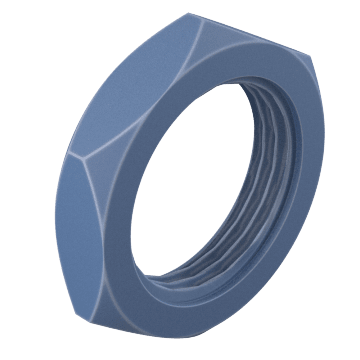 Lock together two threaded ends with these locknuts. Adding a locknut to a joint increases the joint's stability and reduces the effect of vibrations, which can loosen the fittings and cause the pipe to fail. They are hex shaped, which allows you to tighten or loosen with a standard wrench. 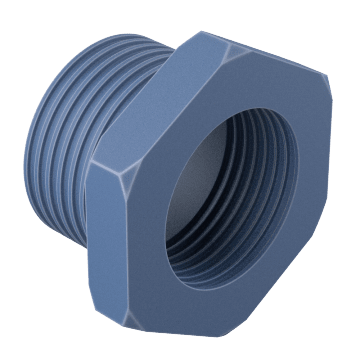 Unscrew the hex-shaped nut on these union fittings with a standard wrench to install, remove, clean, or maintain pipe sections with less disruption to your system than threaded fittings that require full pipe rotation to remove. They have female ends for use with male pipe. 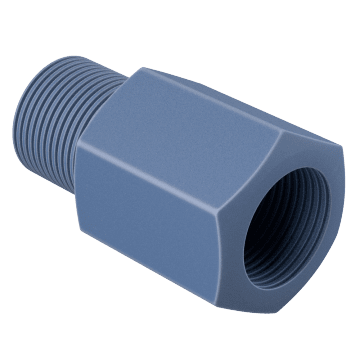 Stop or direct the flow of material in your pipe system and protect external threads on pipe ends and fittings using these caps. 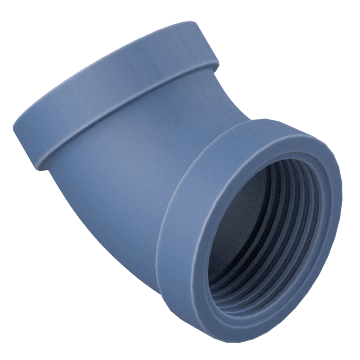 Unlike plugs, they are installed on the outside of a pipe end. 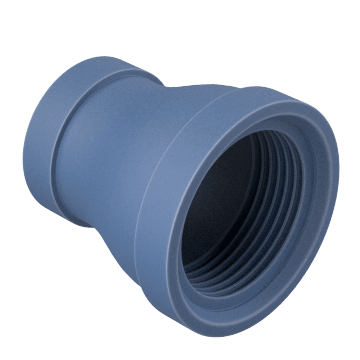 Also known as cleanout plugs, these thin, wafer-shaped plugs are typically installed on the end of cleanout pipes to help keep wastewater from entering the cleanout pipe and to make sure it flows into the sewage pipe. 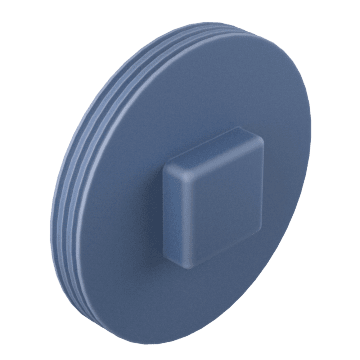 These plugs also stop hazardous fumes and gases from escaping and help keep debris out of the line. These male plugs fit into female pipe ends. 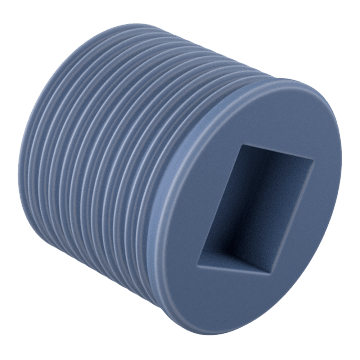 Screw one of these threaded plugs with square heads inside the female end of a pipe or fitting to block material flow or to redirect flow in fittings with multiple heads, such as wyes or tees. Use a compatible socket wrench to install. 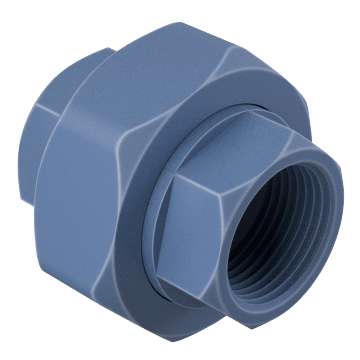 Use a square-ended hex key wrench to screw these male-threaded square socket plugs inside the female end of a pipe or fitting. 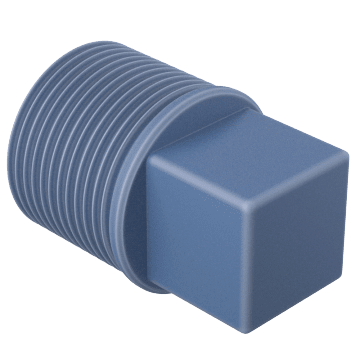 They block material flow or redirect flow in fittings with multiple heads, such as wyes or tees. Without any protrusions, these give your pipe run a smooth, finished look.